The holidays are upon us. Years past I’ve always made Christmas Crack and while the recipe makes a lot (I like to give something edible and yummy as little gifts) and is damn freaking tasty, it’s also kind of a pain to make. And, having lost 50 pounds recently, I just didn’t want the temptation so I searched for something easier- but just as yummy as a treat- and came across Slow Cooker Cinnamon Almonds on Pinterest. These are seriously so freaking delicious. And easy. And delicious. And they smell amazing. And they’re delicious! 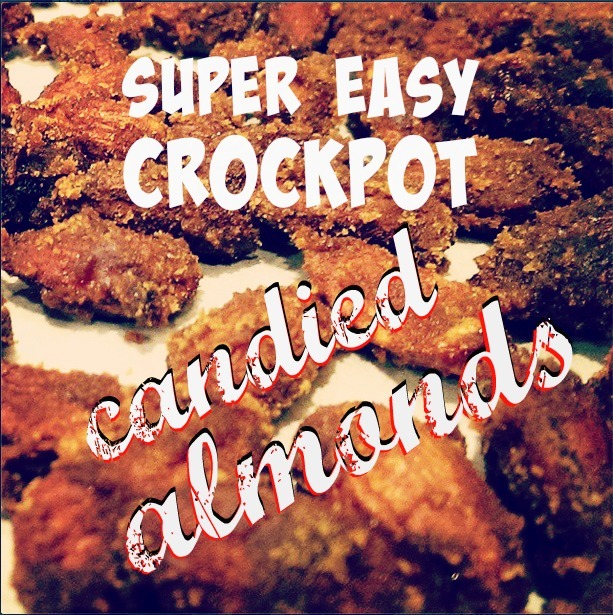 I read different recipes (which were all the same) and comments and kind of did my own thing, which is why I’m calling them Candied Almonds and posting my own recipe. Ready for something fantastic and easy and oh so delicious that will make your house smell so incredible? In a bowl, combine 1 cup white sugar, 1 cup brown sugar, 2 Tablespoon cinnamon (I only had like 1 Tablespoon so I also added some Nutmeg) and mix. In another, larger bowl beat one egg white and 2 Teaspoon Vanilla extract until nice and frothy. Then add your almonds to this and make sure to stir and coat every almond with the froth. Once that’s done, add your sugar mixture and mix mix mix mix mix. Then spray a crockpot with cooking spray, dump the almonds inside, cover, and cook on low for 3-4 hours, stirring every 20 minutes or so. About an hour before time is up, add a little water (I added some water to my cinnamon jar to get all the cinnamon I could since I was too lazy to go to the store on the Sunday before Thanksgiving for cinnamon) and stir stir stir. And keep checking on it and stirring it until most of the liquid dissipates. When that happens, after about 3-4 hours total, dump mixture onto parchment paper and, with clean hands, separate almonds or they will stay clumped together. Let sit and cool for HOURS. Then you can jar up (the remainder- because let’s be honest, you’re going to be eating a LOT of this in the process… you know… to test it out and ensure it all tastes the way it should) and give someone a gift of these fantastic yummies!